Omega Audio Video, LLC has been chosen to design and install a large venue audio video system in the Elm Street Cultural Arts Village 600 seat theater. The installation will center around a new Vutec 250” automated video screen that will retract in the ceiling when not in use. The video system also will incorporate the latest Mitsubishi Digital Projection system that uses a dual lamp for 7000 lumens of brightness. The audio system will utilize the high output SoundTube HSi series speakers with Crown amplifiers driving the speakers. The system will be used for independent films and classic movies that will be free to the public. The Elm Street Cultural Arts Village is at the center of a city wide revitalization of historic downtown Woodstock. Omega Audio Video is a proud partner of the Elm Street Cultural Arts Village. The website is being refreshed – please pardon the dust while we remodel. 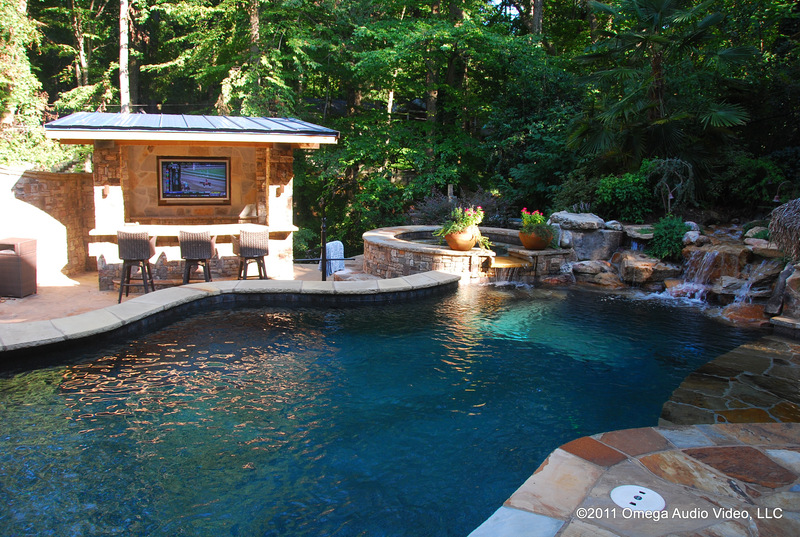 Omega Audio Video, LLC has recently completed an installation at a private residence in Buckhead which attractively boasts a 55” SunBrite Outdoor HDTV as the focal point of the design. 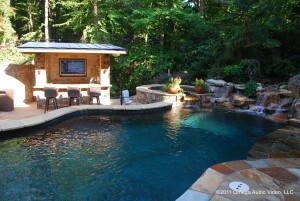 The 55” 1080P Flat Panel has been recessed into a stone wall directly behind the outdoor bar, giving those at the bar, in the pool or lounging by the outdoor fireplace a great view without spoiling the aesthetics of the outdoor space. There are also several SoundTube SM-500i speakers for full sound coverage. Taking care of the low end is a water shaking SoundTube RS-1001i 10” subwoofer tucked in a cove behind the Jacuzzi. The amplification system is thru a few Parasound Amplifiers. The system is controlled by Universal Remote’s fantastic MX-880 automated remote control giving the client everything they demand by using one touch macro’s to control the system. Anything the client needs is at the push of a button. This system can be used to watch the horse races from the pool or as an outdoor party lounge, providing an unbelievable cool factor.